I grew up in an Anglican family in North West Province and attended church regularly. In fact, when my father was a sub-deacon, I was a server. I knew, from an early age, that I wanted to serve God through the Church for the rest of my life. In 1978 this feeling became much stronger and finally, during a service at a Methodist church, Revd. Ike Moloabi, leading the service called for those who felt a calling to the ministry to step forward. I felt compelled to respond. Revd. Ike Moloabi has remained my mentor to this day. In response to the call, I enrolled at St Paul’s in 1982, the Anglican seminary in Grahamstown where, in my first year, I was the only black African. Coming from the North West, Afrikaans had been my second language and language of instruction up until then. However, I was required to study in English. I was not deterred by this and finished my diploma in theology three years later. In December 1984 I was ordained as a deacon, and in September 1985 to the priesthood. My first parish was in Ikageng, near Potchefstroom, where I worked as an assistant clergy for two years. In addition to my regular duties, I also became involved in an education crisis committee. I sought, as part of my work with the committee, to discourage learners from boycotting school, as I believed that when apartheid ended, those with an education would be vital in running the country. This early experience shaped what would become my lifelong passions –reconciliation and youth development. Reconciliation has always been what I work hard for and will continue to do so, both in South Africa and within the Church. In 1988 I joined the parish of St Hilda’s in Senaoane, Soweto, as rector. I found myself in the heart of what was described, at the time, as “black on black violence”. I was involved in bringing about stability in the area by engaging with the leaders of organisations such as Azanian People’s Organisation (AZAPO), the United Democratic Front (UDF) and the Inkatha Freedom Party (IFP), encouraging them to work together towards the common goal of freedom. During this time, I was invited to New York to share the South African church experience where I also gave talks at the Sociology Department at the University of Colorado. Public recognition of my reconciliation efforts continued and when South Africa’s first democratic elections took place in 1994, I was asked to be a presiding officer in Senaoane. I believe that reconciliation should be an ongoing subject matter in our society. There is a need to reconcile the different ways that people worship within the church. Understanding this, recognising it and allowing for it, is crucial to a unified Church. One of my priorities is making the Church relevant. We are in Africa. Let’s be a Church in Africa and allow people to celebrate who they are. As a Church, led by the previous Bishops, we fought apartheid. This laid the groundwork and built the bridges. Now it’s up to us to make it possible for people to take one another across the bridges. I actively welcome and celebrate the philosophy that allows different beliefs about the interpretation of the scriptures to co-exist within Anglicanism. Within the broader and widely held belief that human beings are created in the image of God, all other theological debates become less significant. My belief in reconciliation and compromise has also made me realise the importance of resilience in priests. It’s not a word we often think of to describe ourselves, but it’s what I needed and what I still need on a daily basis. The truth is that, while spirituality is essential for priests, ministering to today’s people in today’s times makes resilience an incredibly important tool for effective ministry. I am proud of where I am because I have faced multiple challenges during my time in the priesthood, both pastorally and personally. I have managed to deal with these multiple challenges and believe my personal resilience is an example of the way the Church, too, should work. I believe the Church needs a new vision, one that will create resilient priests, who are prepared for and supported in ministering in a changing environment. I believe that the Church owes it to its congregants and ministers to create effective support structures for priests. A bishop should be working to support the priests who fall within his/her ambit, helping them to cope with the stresses, which he/she understands because he/she has been in their position. He/she should be a pastor and a shepherd, not an administrator. In my ministry, I stress the importance of allowing people to tell their story. I believe that this is an extremely important process for the Church, as it creates a space in which people can deal with their perceptions about each other. I believe that the Church needs to actively transform and that it is the responsibility of Church leaders to create an environment for sharing. This insistence on the importance of being welcoming is part and parcel of my philosophy for ministering to the youth. Fundamentally, we should not be looking at how to move the youth closer to the Church, but rather how the Church can move closer to the youth. This brings about the importance of “youth mentoring and coaching”. As a young person, I went through both formal and informal mentoring. Training for priesthood did not automatically translate to a good leader. My leadership skills have been acquired over the years through mentoring and development sessions. I have therefore been mentoring many young people who became priests and leaders in the community and in business. I was a warden of Fellowship of Vocation from 1988 to 1998, helping the youth to discern whether God is calling them for a particular ministry. My natural passion for young people has been further honed in through my studies. I completed an advanced course on youth ministry at the University of Pretoria. Learning and studying is important to me. For my BA honours, my mini-thesis was on how to find the identity of a local church and help it achieve its God-given mission within the context of its geographical and social position. My MA in practical theology looked at “The impact of resources on administration and management in the Anglican parishes of Soweto”. I am currently doing my PhD, which I plan to complete in 2013. The proposed topic for my PhD thesis deals with excessive funeral expenditure and I hope that I will be able to develop a working model to help clergy to deal with this phenomenon pastorally. All the above helped me to learn more about how to be an effective minister. My other passion is ecumenism. I believe that no denomination can, or should, achieve the mission of God on its own. 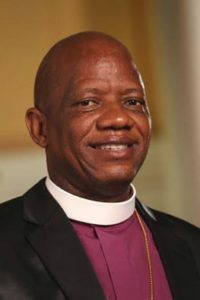 I began my ecumenical outreach through a programme called Partners in Mission, which was an attempt to get Anglican Churches in other countries involved in missions together with the Anglican Church of Southern Africa. As part of this work, I visited churches in New York and became coordinator of the Balm in Gilead HIV/Aids ministry. This New York-based organisation helped pastors in Soweto to work within the context of the Aids pandemic, both theologically and practically. St Matthew’s, where I was rector until 2002, was one of the parishes to encourage HIV-positive people to share their status. I was a board member of Alpha South Africa between 2004 and 2009. I have served as the coordinator of the Church growth portfolio. I introduced the Alpha process in four Anglican and Roman Catholic parishes in Soweto. I am present and visible, not only in crisis, but also in celebration.